Norway’s top coastal agency has some big aspirations. In an effort to make Norway’s Stad Peninsula coastline less dangerous, which is characterized by tumultuous waters, the agency has proposed building a tunnel for ships. And not just any old tunnel, a $272 million, 150 foot-tall, 118 foot-wide, mile-long tunnel for commercial vessels to utilize for safety. There’s a lot of work that has to go into the project to make it a reality, but if it comes to fruition, it will be able to accommodate vessels as big as cruise ships. 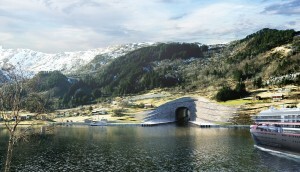 At the moment, the idea is that ships could access the tunnel from the north in Selje, with southern access via the Moldefjord, where the Stad Peninsula is at its narrowest. There will also be an area for bystanders to check out the vessels as they pass through.